I’m quickly becoming a big fan of the Supergirl TV show. I love that they’ve started taking risks and diving into the wider DC mythology with the introduction of Martians (both green and white), Bizarro, adapting the Alan Moore story “For The Man (Girl) Who Has Everything,” and soon to bring in Brainiac 8. Not to mention the Flash crossover!!! which I’m so stoked about. But I’ve been wondering about that comic mythos that Supergirl is embracing and all of the characters it’s bringing in and I thought, wouldn’t it be great if National City had a street level hero running around? I’m on an X-Files kick now so I thought of The Question, but thinking about it more I feel like Kara needs someone more her age not another mentor. Th show should explore that good old trope of pairing the idealistic superpowered hero and the nonpowered, jaded vigilante. National City and Supergirl needs their very own Batman (or Arrow). 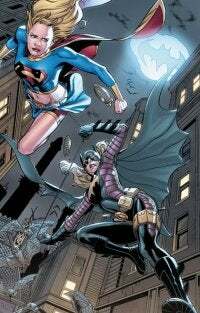 I would love to see Kara interact, debate, fight, and team-up with her own Batgirl. Now, I know it’ll never be Batgirl because the Bat characters are off limits, but someone who skulks in the alleys, beating up drug dealers, demonized by Cat Co., while Supergirl is catching planes and fighting aliens. Someone who bleeds would work well. I’ve been thinking about this and the best candidate that I can come up with is Batgirl, but not Barbara Gordon and not as Batgirl. I’m thinking Stephanie Brown aka Spoiler. She has the Bat Family creds, but will probably never be used in the movies or on Gotham and because she exists in the same grey area as Huntress she could easily be used as a stand alone character without the Batman baggage. She’d also fit in much better with Supergirl’s world than someone like Huntress or Cassandra Cain. And her presence would bring in her father, The Cluemaster, as a more cerebral foe for Kara to fight. I’m not imagining Spoiler as part of the regular cast. She could have one or two episodes a season. Also who wouldn’t want to see the Spoiler costume designed by the same people who created Thea and Nyssa’s costume on Arrow? Stephanie would look absolutely fantastic crouching on a rooftop ledge while Kara hovers—arms crossed—over her. What do you guys think? Would you like to see the introduction of a street level hero on Supergirl?